It won’t be long until this gem of the jungle is gracing the lists of ‘Best Honeymoon Resorts in the world’, find out why from Travel Weekly’s roving reporter. 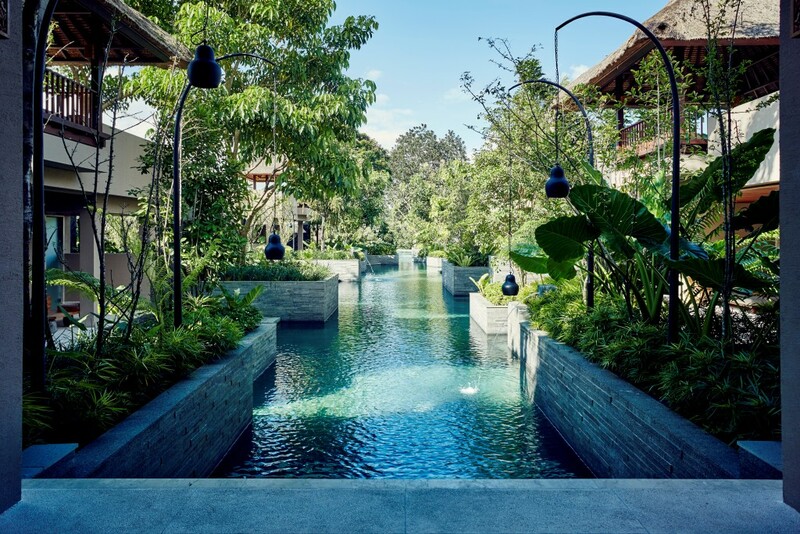 Luxury resort Hoshinoya Bali sits nestled amongst the dense green hills surrounding the Pakerisan River in Ubud; a UNESCO world heritage site whose lush landscape is some of the most iconic in the world. In keeping with the ethos of the Hoshino brand the property works intrinsically with the surrounding nature. The river itself flows through the property and the pool network is created to mirror the ancient canals that have supported neighboring communities for hundreds of years. It’s hard to guess at the magnificence that lies beyond the unassuming concrete walls that line the driveway to Hoshinoya. 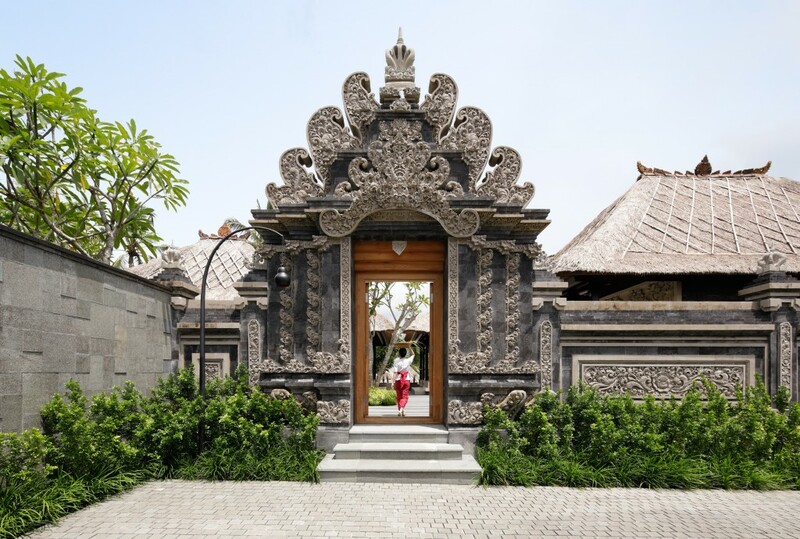 The first hint comes with the ornate temple door, typically Balinese handiwork that opens out into a spacious foyer. Once inside, the sweat and hustle of the Ubud streets drops away and you start to truly appreciate your surroundings. Immediately recognizable is the Japanese architecture and design element. 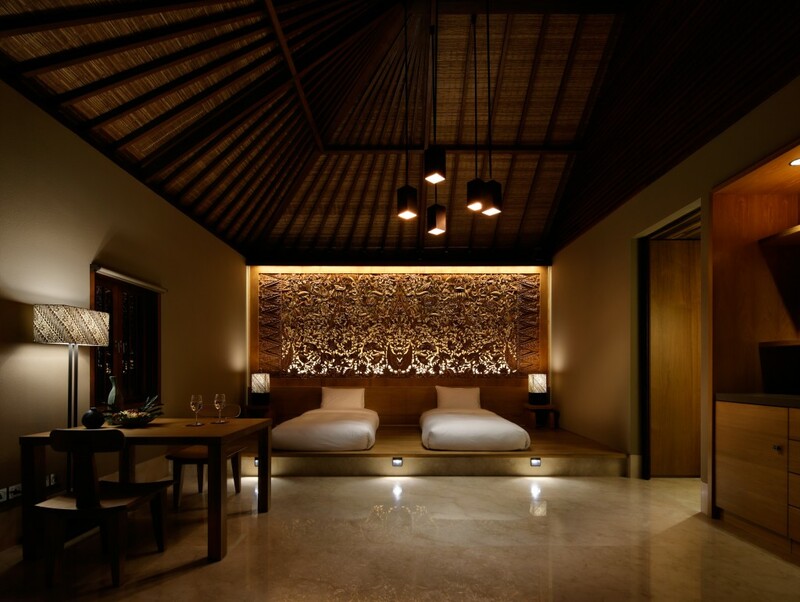 The villas and walkways incorporate clean lines and stripped back wood with flourishes of Balinese carving, a thoughtful reverence to the location. Flying into Ngurah Rai International Airport in Denpasar it takes about 90 minutes to cover the 47km distance to reach the Hoshinoya property. The drive itself through local villages, dotted with temples and rice-terraced fields is a thing of beauty and not to be missed. Optimal arrival time is from morning to early afternoon, to experience the scenery but avoid the hectic traffic that commences from 4pm. Hoshinoya will also organize a driver to pick guests up from the airport, making the trip as smooth as possible. Guests can choose from one of three villa options, each has semi private pool access as well as multi-story lounging areas. These ‘rooms’ are essentially miniature resorts in themselves. With huge bathrooms, a walk in shower, bathtub, dual vanity sinks and a very tech-savvy toilet. There is a level of privacy and intimacy to this style of accommodation that is a rarity making Hoshinoya the most perfect place for a secluded getaway. True to its Japanese heritage the beds at Hoshinoya are futon style, no fuss or frills with the mattresses directly on the ground on the raised mezzanine level. But don’t let the ordinary appearance fool you; these are some of the most comfortable beds guests will ever sleep in! The simple lay out of the sleeping arrangement in these villas is a unique aspect of the resort, in keeping with the paired back luxury evident throughout the entire property. 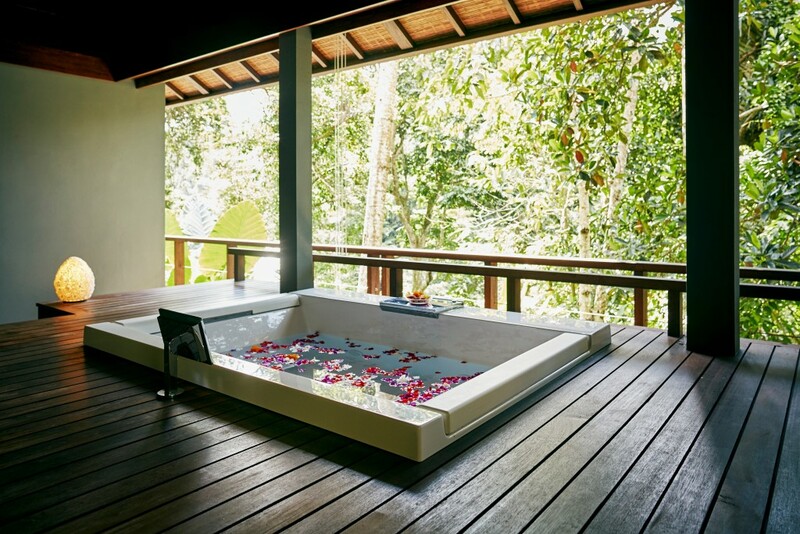 All the elements work together to give guests a sense of tranquility, privacy and general well being. There are several ways to experience a meal at Hoshinoya but let us start at breakfast. Perched atop the gulley in one of four ‘Café Gazebos’ guests can order a picnic style breakfast, a delicate selection of fruit, pastries and freshly brewed coffee. To start the day sipping tea whilst the first rays of sunlight weave through the valley around you is truly a magical moment, one that would no doubt make for an unforgettable honeymoon. The restaurant is positioned on a balcony above the canopy and features traditional and lounge seating options. The proximity to the jungle lets guests witness the sun setting through the valley as huge spiky jackfruit dangle from the nearby trees. All the ingredients are locally sourced with the chefs creating a thoughtful menu that incorporates Balinese flavor with Japanese techniques. 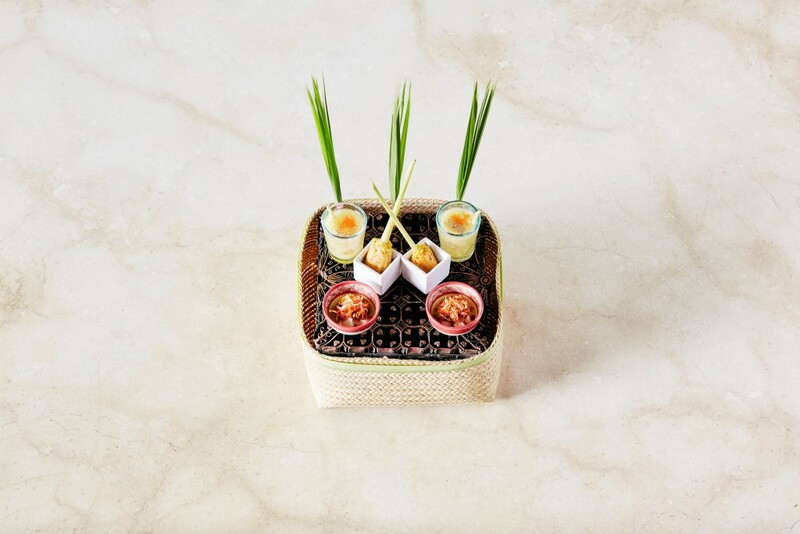 This ethos is embodied perfectly in the contemporary Balinese tasting menu: 9 petite courses that take you on a journey of flavor and texture without the post-meal lethargy that often accompanies this style of dining. The service at Hoshinoya is friendly, discreet and incredibly attentive. What more could you expect with the influence of both Balinese and Japanese cultures, both renown for their exceptional hospitality. Balinese massage is an ancient art that started in the courts of the Javanese King. Veteran practitioners of this technique apply herbal medicine, rice flour, and other natural ingredients to revive the skin’s vitality, while easing muscular and spiritual tension. 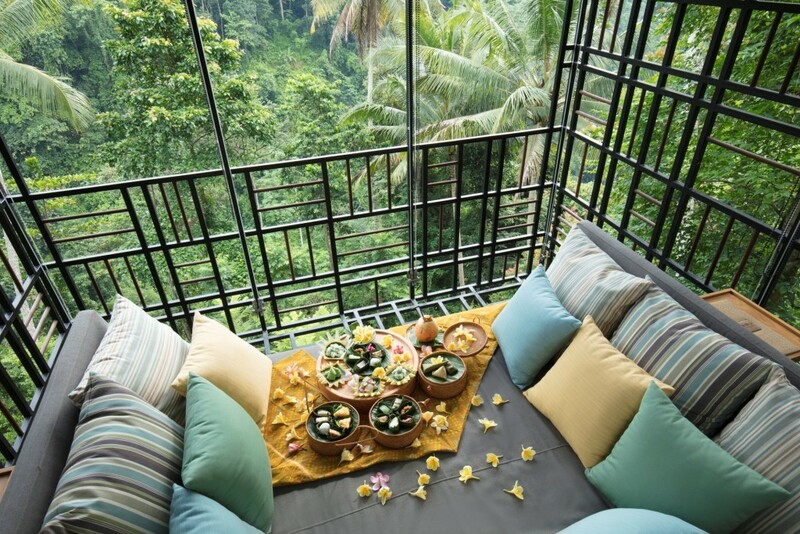 Spa rooms are located halfway downhill from the resort, so guests become more attuned to the sounds and energies of the jungle, as well as the Pakerisan River below, an environment more conducive to deep relaxation. Already a preference for Japanese visitors, Hoshinoya is the unearthed gem waiting to explode onto the honeymoon scene for Australian travellers. With it’s blend of wellness, culture and grandeur, this Balinese hideaway will no doubt become a must-see for couples, corporate and luxury travellers alike. 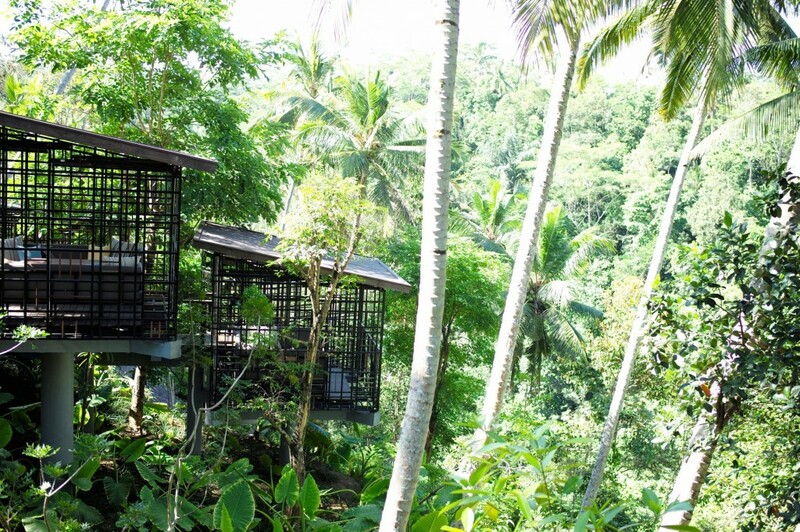 The perfect addition to any Bali holiday, a sanctuary to unwind and balance out the frenetic energy of the outside world. Furthermore with factors like ‘instagramability’ now topping travellers’ checklists, Hoshinoya, with its jungle backdrop and impeccable design will not disappoint. It’s the subtle yet attentive service, the perfectly executed design and the respect for both natural and cultural surroundings that make this latest string in Hoshino’s bow so exquisite. Virtuoso CEO: "Tourism can be a force for good or it can be destructive"